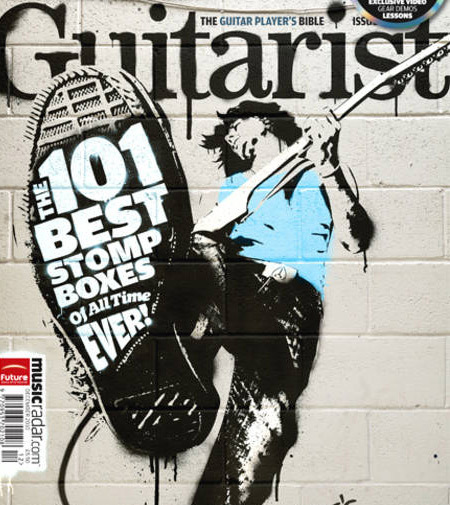 In December, Guitarist Magazine put out the 101 Best Stomp Boxes of ‘all time’ issue featuring what they believe is complete list of the 101 greatest stomp boxes. I thought this would be a great list to show EffectsBay.com readers… especially if you’re looking for something new or different.. but not sure what that could be. Having a list like this can sometimes lead to new discoveries. This list contains current pedals as well as hard-to-get vintage models as well. Additionally, I’m curious how you guys think this list looks? Do you have a better recommendation for the top 10 stomp boxes of all time? If so, please comment below. Anything missing? Anything that you would say should not be in the list? This list is pretty comprehensive though I’d like to have seen the Seymour Duncan Twin Tube Classic in there. Otherwise a pretty perfect list. That’s a pretty good list… But I must contend that the Boss DD-20 GigaDelay belongs in there SOMEWHERE in the top 25. 1. Boss DS-1 rated so highly. It really is not all that great IMHO. This over-hyped pedal sounds really thin with no punch. The DS-1 was actually used by many artists including Joe Satriani, Kurt Cobain and Steve Vai to name a few, BUT most of the big artists and many amateurs don’t use the stock one. Most are modded (by Keeley or others) up the wazoo. I enjoyed reading this issue when it was published. A few years ago, the drummer in the band I was playing in at the time asked me if I had to keep one pedal, what would it be. I instantly said my Crybaby Wah; so in many ways, I was pleased to see it at No1. Was this list made up by dope fiends in drug rehab?? It ignores entire industries like BBE, Rocktron and DiGiTech. Boss SD-1 should be in the top 10. I don’t see MXR Distortion +, either. No Scrambler, Blender or Devi! Booooooooooo! Definitive sound of Swedish Death Metal. @Jim DooDaddy: You know I completely missed the lack of Digitech. I’m no bigot… Digitech makes GREAT pedals despite the fact that they’re “digital”. I am totally in love with my Turbo Flange. Out of all the Flangers I’ve used, it’s still my favorite. I can’t afford the “vintage” flangers so I haven’t really used any but out of the Ibanez, Boss, etc crowd, the Turbo Flange is my favorite. And the RP25x/35x are great on the go effects units! Where is the Ethos overdrive? Where is the Captain Coconut II ? Where is the MI Audio Tube Zone? I missed BB Preamp by Xotic. Best overdrive I heard! I would’ve put the Malekko Ekko 616 over the MXR Carbon Copy. Where are the Strymon pedals? A bit pricey, but well worth it. I’d include the Blue Sky Reverberator, the Flint Trem/Reverb, and the Lex Rotary, all astonishingly great pedals. Admittedly, it would be too much to expect them to include everyone’s top 101 pedals, but at the very least they should have included the EP Booster, the Timeline and the Timefactor since they are incredibly popular. However, the MM4, FZ-2 and Ice 9 shouldn’t be in the list and the DS-1 should be somewhere around the bottom of the list. Carbon Copy should be somewhere within the Top 20, plainly because of its popularity. Surprised not to see any Keeley on here. The Keeley Compressor is fantastic as is the Katana. Also no TC Electronic. The Flashback and the Hall of Fame! @simon…the Ethos Overdrive and the Captain Coconut II are both on the list, dude. NOTE: I am aware this list is four years old. These are just two suggestions for a revision. I think because of the versatility, the ease of use, the control, the dynamicism, the range of options, the 300 banks of storage, the gorgeous and lush sounding reverbs (with 12 modeled presets to go off of before you can dive in and make them your own), it’s ability to maintain your tone, and the headroom you have to explore, the Strymon Big Sky is without a doubt the best reverb unit of all-time SO far. It took a lot of creativity to even envision the features of this glorious pedal, let alone the power a single player has when they finally get to it. Even though the Strymon Blue Sky unit is a wonderful pedal, it’s a bit of a redundancy when compared to the Big Sky. It saves money, and a little space, but the power and control you have over the Big Sky is undeniable, next-to-limitless, and worth the extra $200 (yes, I meant that) and a few inches on your board. Honestly, I think the Strymon Big Sky is the best pedal of all-time.